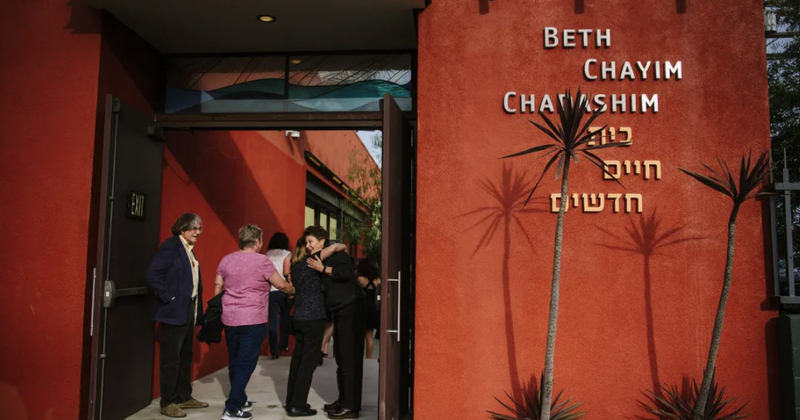 The Beth Chayim Synagogue in Los Angeles has supported the LGBT+ community since its opening in 1972. News 3 December, 2018 . Written by Sarah McKenna Barry. Last night marked the beginning of the Jewish holiday Hanukkah. The Festival of Lights commemorates the rededication of the Second Temple in Jerusalem during the Maccabean Revolt and is observed for eight nights by the Jewish community around the world. One such synagogue celebrating Hanukkah is the Beth Chayim Chadashim or the House of New Life Synagogue in Los Angeles. Additionally, the BCC is considered to be the world’s first LGBT+ synagogue. On the BCC’s website, the synagogue, which was founded in 1972, describes itself as “an inclusive community of progressive lesbian, gay, bisexual, transgender and heterosexual Jews, and our families and friends”. Rabbi Edwards regularly rallies against all forms of discrimination, while using her position in the community to advocate for the LGBT+ community at large. The Jewish Daily Forward named Edwards one of the 36 “Most Inspiring Rabbis”, while the City of Los Angeles recognised her as one of the seven “LGBT Leaders and Legends”. Cantor @JuvalPorat and Rabbi Lisa Edwards lead Shabbat Services tonight at 8pm — with words for #WorldAIDSDay from Bob Levy. Join them for singing and prayers as we welcome Shabbat. The synagogue regularly incorporates issues pertinent to the LGBT+ community into their services. For instance, on Saturday Bob Levy joined Rabbi Edwards and Cantor Juval Porat at Shabatt Services to speak about World Aids Day. Moreover, the BCC has been rolling out Project Chicken Soup which distributes over 30,000 kosher meals a year to housebound clients with AIDS, cancer and other serious illnesses since the ’80s. Hanukkah continues nightly until December 10.